Home to lots of ancient temples and temple remains, Siem Reap is a traveler’s fairyland. There are various places to visit in Siem Reap exuding spiritualism and charm that let you travel back in time and learn about the ancient Angkor civilization. The resort town of Siem Reap is also one of the cheapest tourist destinations in the world luring armies of backpackers and budget travelers every year. 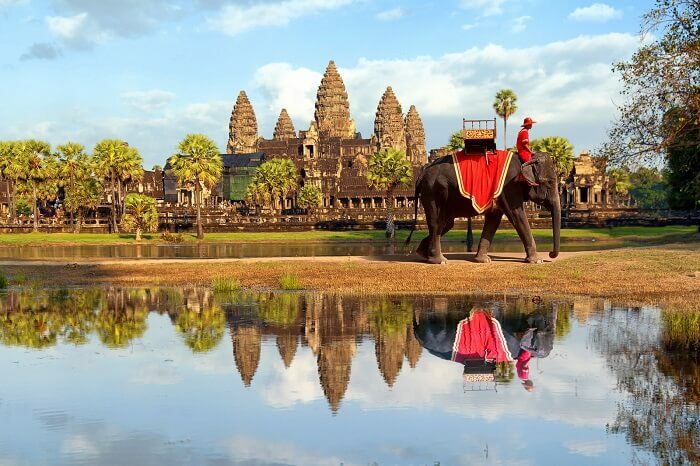 You’ll find the most popular Siem Reap tourist attractions in this list. 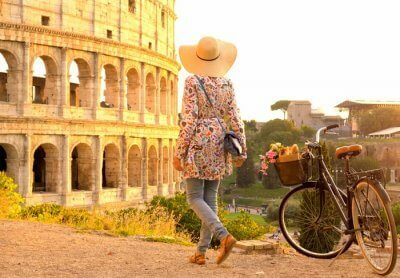 But first, let’s look at the ideal time to visit. Angkor Thom is an out-of-the-world place with extremely beautiful temples remains from a bygone era. The Bayon Temple has 54 towers containing 216 stone faces of Avalokitesvara that will leave you wonderstruck. 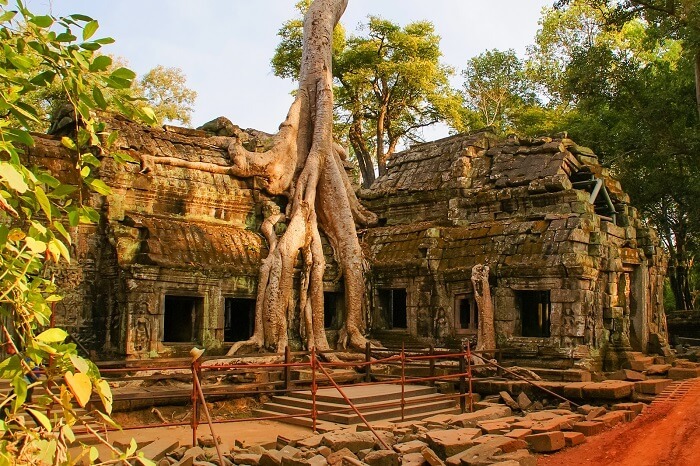 There are lots of other temples like the Preah Khan, Banteay Srei, and the Ta Prohm famous for its ruins wound by tree roots. You’ll need a tuk-tuk to cover all the temples within Angkor Thom. The Terrace of the Elephants on the South and the Terrace of the Leper King on the North form the Eastern boundary of the Royal Palace. 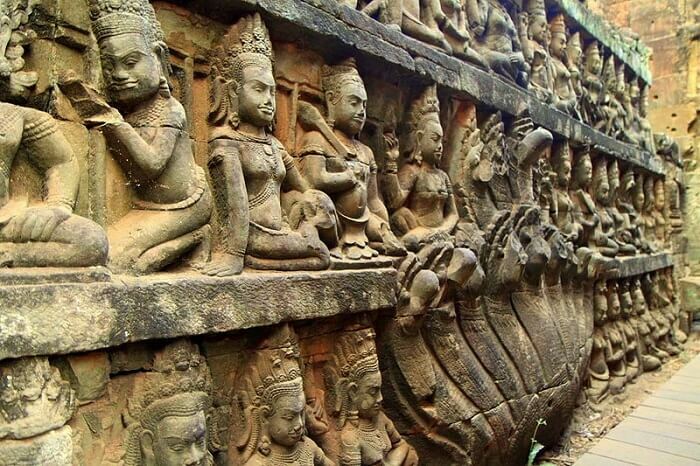 It has carved sculptures of celestial Apsaras, Devatas, mythological animals like hive headed snakes and demons. The king used these Siem Reap attractions to see processions and parades and listen to people’s complaints. Bakong is the first of Angkor’s large mountain temples. Dating back to the 9th century, this temple was dedicated to Lord Shiva as learned from a plate found at the temple. The main Linga, ‘Sri Indraswara’ was consecrated in 881 in the inner sanctuary, putting this temple in the list of unmissable places to visit in Siem Reap. This UNESCO World Heritage Centre is an architectural marvel with five lotus-like towers rising 65 meters in the sky. 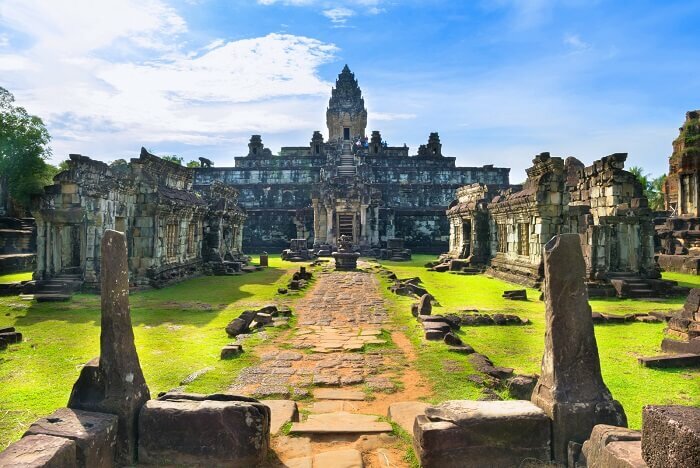 It’s the ruins of the world’s largest religious building that was first dedicated to Lord Vishnu, and later became a Buddhist sanctum with four Buddha statues facing different directions. The walls have wonderful scenes depicting “Churning of the Ocean Milk”, Hell and Heaven, War, etc, making it one of the primary places to visit in Siem Reap. Neak Pean is a circular artificial island with a Buddhist temple in the centre. There are beliefs that the temple was originally dedicated to Avalokitesvara and the pools here were designed for curing diseases. Your Siem Reap sightseeing is not complete without checking out the sculptures of snakes around the base of the temple. 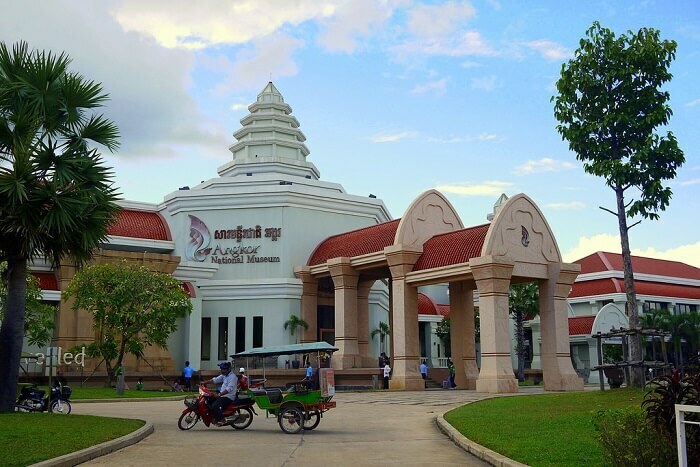 The Museum has an enviable collection of Buddhist and Hindu treasures found from the Angkor Wat temples that will astonish you with the rich Angkor civilization. 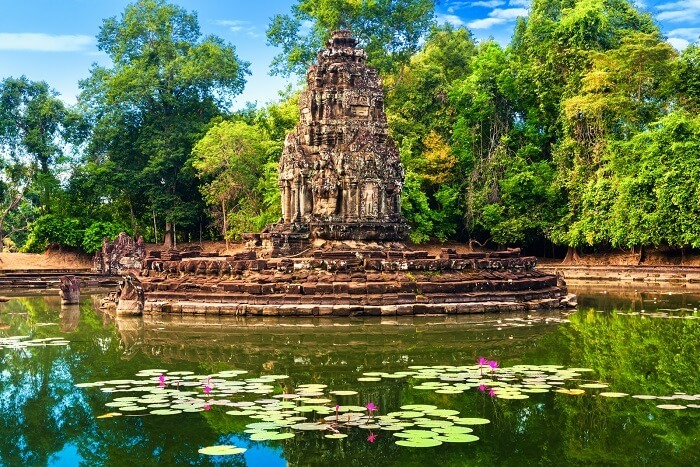 If you are looking for places to learn the Cambodian history, this Siem Reap Cambodia points of interest is the place to be. This museum tells how a man named Aki Ra cleared the landmines with a stick to collect a house full of defused dynamites. 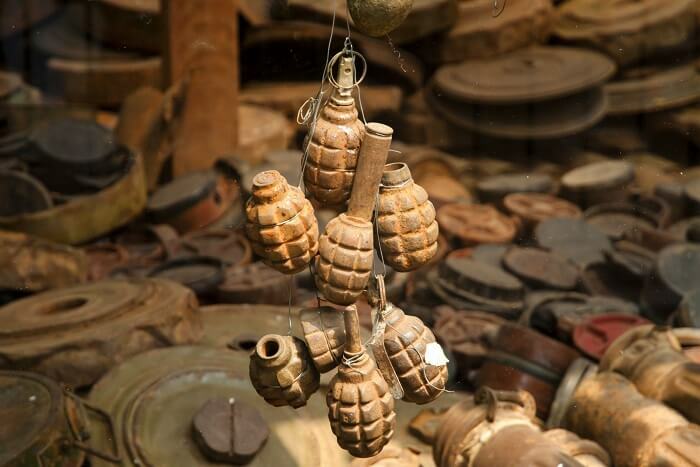 It explains the hazards of landmines and why the war is only half the problem. The museum houses a Child Relief Center to care for children living at the museum and is among the best Siem Reap places to visit to break the long temple tour. 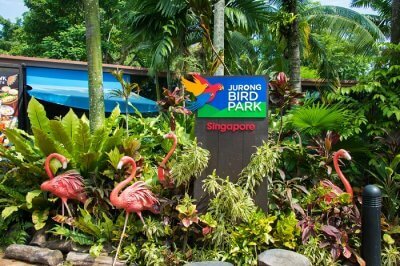 This is Southeast Asia’s largest butterfly center where you can spot butterflies of all colours and sizes flying within large netted enclosures. It’s one of the most loved tourist attractions in Siem Reap Cambodia owing to its lush green cover and vibrant flowers like Ixora and orchids. 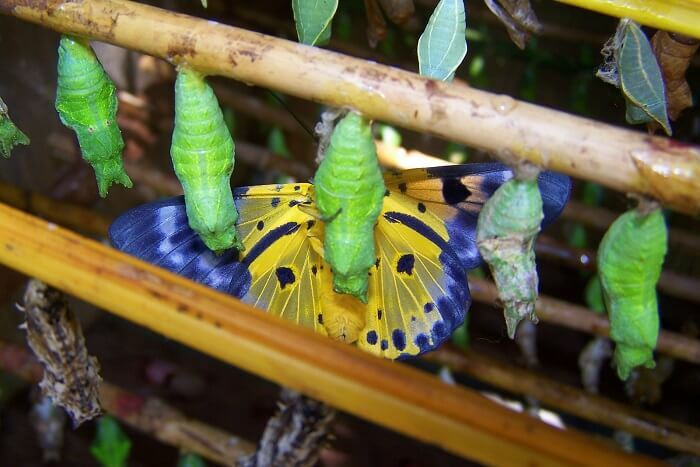 Here, you can see the various stages of butterfly metamorphosis and even spot them flutter around if you are lucky! The Angkor Night Market gets busy after the sun sets with small shops selling Khmer Artwork and local handicrafts. You can relish local delicacies like lol-lak and barbecued pork! 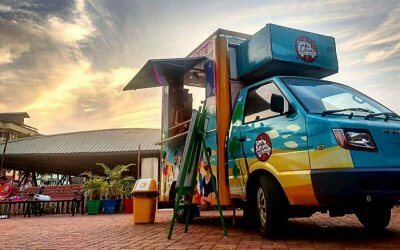 Experience Cambodia’s nightlife at the various restaurants and bars here. 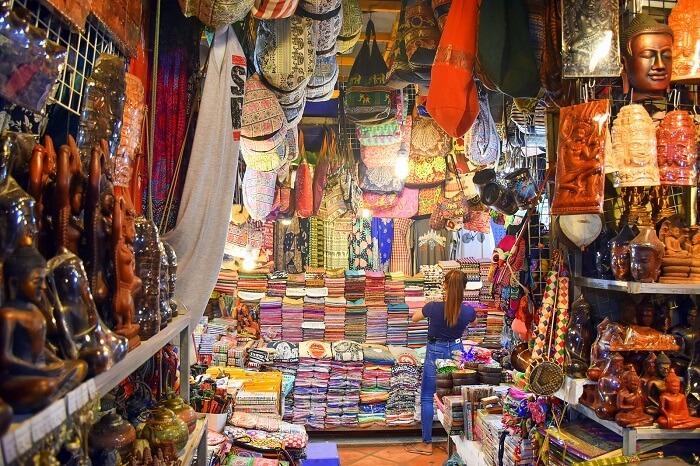 There are no better places to visit in Siem Reap for shopping than Night Market. 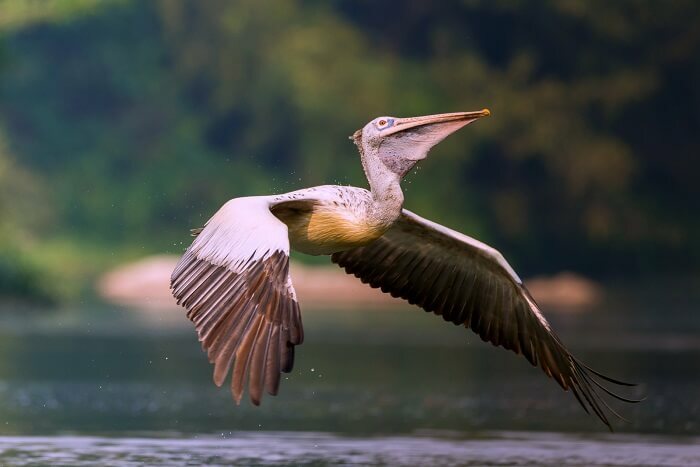 This mesmerizing bird sanctuary is one of the three biospheres in Tonle Sap Lake and is home to a number of exotic birds like Adjutant Storks, Milky Stork, and the Spot-Billed Pelican. 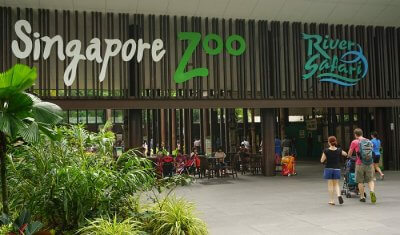 The best time to visit is from December to early February when spotting these aviaries is fairly easy. Though we have tried to list the best of places to visit in Siem Reap, there are a lot more waiting to be explored. 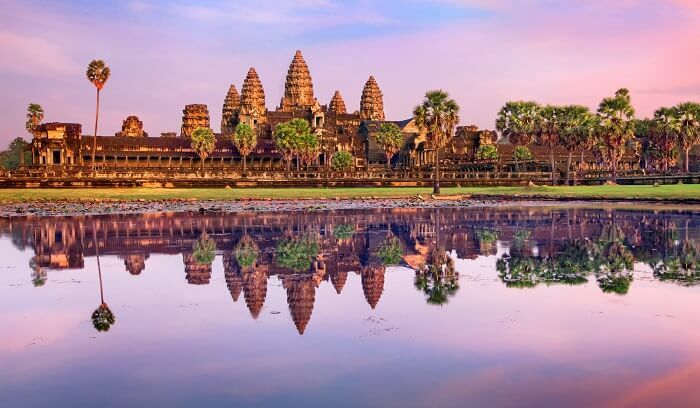 Book a trip to Cambodia right away and get started on the ones listed here first!